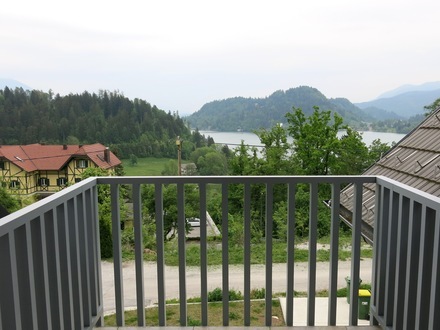 Holiday house Villa Rečica Bled is a modern and spacious holiday house located in the quiet part of Bled, only a couple of hundred meters away from Lake Bled and offers guests the best views over the lake with the church on top of the island and the Karawanks. The holiday house Villa Rečica Bled can welcome from 4 to 7 guests and stretches itself on three floors. It has two bedrooms, a mezzanine, two bathrooms, a kitchen with a dining area, a living room, a sauna, a terrace, a balcony and two covered parking spaces. Bled offers visitors plenty of fun pastime activities – from hiking in the nearby mountains, taking walks around lake Bled and the Vintagar gorge, cycling at Pokljuka, swimming in the lake and rowing on it to canyoning, rafting and kayaking. Bled is the perfect starting point to explore Slovenia. Only a 30-minute drive and you can be in Bohinj, Ljubljana, Škofja Loka or at the ski slope of Vogel, ski slope Krvavec and ski slope Kranjska Gora. Holiday house Villa Rečica Bled. Holiday house Bled. Villa Bled. Apartment Bled.